Sometimes junk makes the best art. 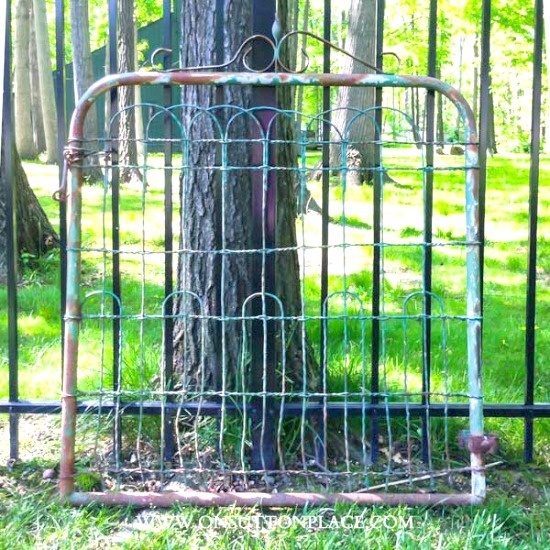 See how I rescued this vintage garden gate and used it as screened in porch decor. Free is always good! As promised in my last post where I showed you my summer porch decor, I’m back to tell the story of how I came to own this vintage garden gate. Before I start, I want to thank each and everyone of you who left a comment on that post. I was actually quite overwhelmed and so touched. How I got such amazing friends I will never know but I am incredibly thankful. A few years ago, all on her own, Elizabeth bought a little brick bungalow. I did some posts when my blog was very new (lots of bad pics) featuring her house and some of the projects we completed. Projects are always going on and recently we began working on her back yard. Running along one side of her property is a wire fence. There is no way of knowing how old it is but I would venture to say it was installed when the house was built in 1954. Attached to this fence was a rusted, ancient, vintage garden gate. There were still traces of green paint and the original latch hook was miraculously still there as well. I asked her, half kidding, if I could have the gate. She looked at me as though I had two heads…but said “OK if you really want it.” We tried to get it off the post (pictured below) but it wouldn’t budge. We gave up and I forgot about it. The next day as I was packing the car to come home, she came around the back of the house with her boyfriend, carrying the gate. She had asked him to help get it off the post so I could have it. I think her boyfriend thought I was nuts and rightfully so…but the fact that she went to the trouble to find a way to get the gate off the post means the world to me. So home with me it came and it didn’t take me long to decide where it would go. The obvious place, in my opinion, was my back porch. I hosed it off and sprayed it with a coat of clear matte poly. I already had nails in the wall so I attached some wire to the gate and hung it up. It looks right at home. It’s almost exactly the same width as my Grandmother’s chest. (Which incidentally lived on her back porch too.) I love that it has a story…and that it came from a place near to my heart. Elizabeth probably won’t live in her little house forever, but even if she moves I will always have a little piece of it…and someday if she wants it back, it’s here for the taking. Thanks for listening to my story…and for visiting. I love your gate and have wanted to find one for myself. One of these days! I left that same gate at the little blue house. I would love to have brought it here with me! That is the coolest gate ever, Ann! And I love how you decorated with it! My Great Grandma had a fence and gate just like that around her property. I would have given anything to have found that gate! I did find a miniature gate just like that, a few years ago, in a little shop in Door County, Wisconsin and grabbed it, it’s hanging on my wall. I love it. Ann, I LOVE that gate! It looks delightful there and I just love your whole porch too – I could live there for the summer! 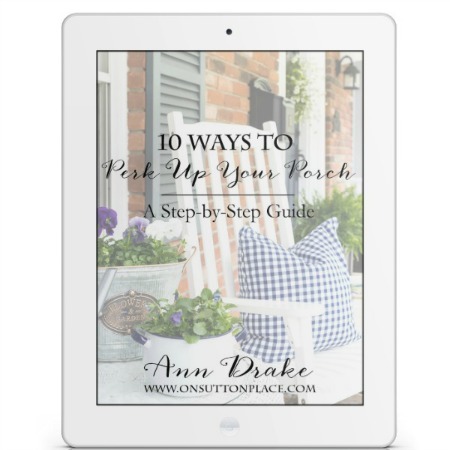 I love love love your porch, Ann!!! And the story of the gate makes it all the more special!!! What a great rug!!! Gotta catch up on your recent posts! We have had a lot of company lately! Sweet post, Ann. I think items at home should reflect our story of who we are. Your daughter is so pretty, but then again she has great genes! Ann, what a great little story. Memories, such as this one, are what can be passed along to future generations. Perhaps one day your daughter will be telling her grandchildren about the gate hanging on her wall. I love the gate! I’m so jealous! Ann, that is a wonderful story about your grandmother’s dresser. I never got to know my grandma since she passed away shortly after I was born, but my mom gave me some tablecloths, doilies and runners that my grandma crocheted. I love to put them out from time to time and I think of her crocheting away as my mom told me she always loved doing. She could not read or write English, but she was able to look at an item, remember it and go home and crochet it! 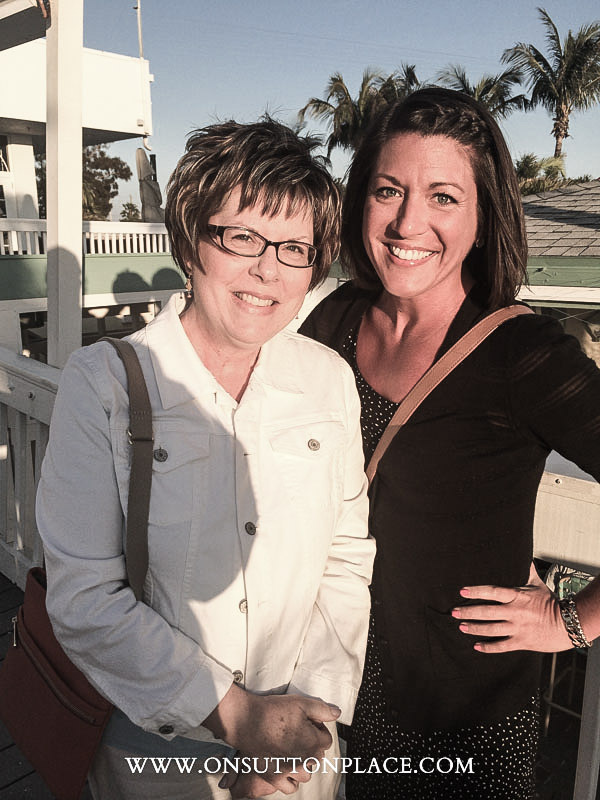 I don’t have any daughters, but I do have one wonderful daughter-in-law who I am able to share moments that are very special too. Your grandma being able to look at something and crochet it reminds me of my Grandma Godwin. She could look at a dress or article of clothing in a book or magazine, or someone wear it and take newspaper and make a pattern and sew it. It would look just like the original! I can barely use a commercial pattern and how it ends up looking is a toss-up, hehe~~I can crochet, but only flat items like a doily, afghan or tablecloth, nothing shaped like a sweater. *sigh* I guess we all have our own gifts. I never knew my Grandmother Jones, she died before I was born also. I’m just happy to have some of their things and my hope is that my family with continue cherishing these and my creations for their children and grandchildren. I read all the comments and agree with all of them. Love the gate and what it represents. Having it above your Grandmas chest on your porch, beautiful memories. What an adorable outdoor room! Of course, I love the gate but also love the rug and touches of green (my favorite color!). It’s just so inviting. I would kill to have an outdoor space like that,lol! I’m thinking that boyfriend may be a keeper! How sweet of him and your daughter freeing the gate so that it could come reside on your porch! It looks fabulous! He is so nice Jane but I’m not counting my chickens before they are hatched. I’ve done that before and gotten into trouble! Dori you are simply the best friend…thank you so much for leaving not one but two comments! I’ll be by to visit you and Andrea soon. I saw her post about the picket fence garden but I didn’t know she got the gate through your trade. Well done! And yes, comments on our blogs from readers and other bloggers is always such a lift. It’s been such a pleasant surprise to me how much it means. Hope you’re having a lovely week, Ann! Oh Ann, what a charming and beautiful story. Your daughter reminds me of mine. She knows how much I like/love old things. Such a sweet story. Aren’t daughters wonderful (of course they have their “off” days as well). I just love the way the gate looks. I actually wish I could find one to hang in my living room, since I started decorating more “rustic eclectic.” I love old pine (have an old tool trunk as a coffee table) and a pine cupboard someone built out of old pine, which holds my flat screen TV. I think a gate would look wonderful over it. Also have an old sewing machine base with a wood top used as a display table under an old English pine plate rack. Now I just have to paint my Mother’s rocking chair (bought some Annie Sloan paint). I think I told you that my daughter decorates in your style….very traditional. Thank you for all your ideas. I’m told if you find these gates at antique malls they are a bit pricey but you might get lucky at a flea market or salvage yard. Good luck…your home sounds wonderful! Hi Ann, I’ve just signed up to follow you everywhere! Pinterest, blog, facebook, Please come visit when you have time! Hi Rita May! I left a comment on your blog but then I got a returned email saying it didn’t go through…just know I tried. Thank you so much for following along! My grandmother had a garden gate like that. Makes me miss her. Love how you repurposed it. You could also pin photos to it. I know Margaret…isn’t it funny how some things bring back a rush of memories and feelings? Thank you for stopping by! Ha! Isn’t if funny how their projects seem to become ours? I love it though and I’m sure you do too. Thanks for your comment! You are a very special lady and mom. I so glad you take the time to share such warm moments in your life. That gate has the perfect place and home. What a lovely thing to say…thank you so much! I love your gate Ann. I think the story of it coming from your daughter’s house is so special. I get so sentimental anymore that I can relate to the gate story. It looks great on your porch. I know Barbie…the older I get the more sentimental I become…oh well. It’s better than being old and grouchy! It looks lovely! Does your chest stay on the porch year round? If so, is it not affected by the rain, humidity, heat , cold, etc.? Well that’s a good question. That chest actually lived on my Grandmother’s back porch. She stored tools, clothes pins, nails, you name it. No one wanted it after she passed away and it was in danger of going to the dump. I brought it home and it sat in my garage for more years than I will admit. Finally a few years ago I cleaned it up and painted it white. It’s worn fine and doesn’t seem to have suffered any problems from the weather. So it really went from her porch to mine. Thanks for visiting and for your question! Oh thank YOU Ann! I have so many ideas for my front porch now!! Your gate is FABULOUS and looks perfect on your beautiful porch!! LOVE the hint of green that’s left on it. I know…I saw your post about your garden and your Mom told me where your gate came from! I’ll be by to visit soon. Thank you so much for your comment! p.s. I miss you! You and your daughter lift my heart with your kindness to each other. The gate arrangement and all of the porch looks spectacular. The chairs just need to be filled with sweet ladies drinking frosty glasses of iced tea. You tell the story of the gate as only a loving mother could tell it. It is not the expensive gifts given to us through life that we cherish but rather the small personal experiences we create in life. Keep writing from your heart, you have won us over. Love your approach to decorating. Love what you love too. Ann your porch looks beautiful!! 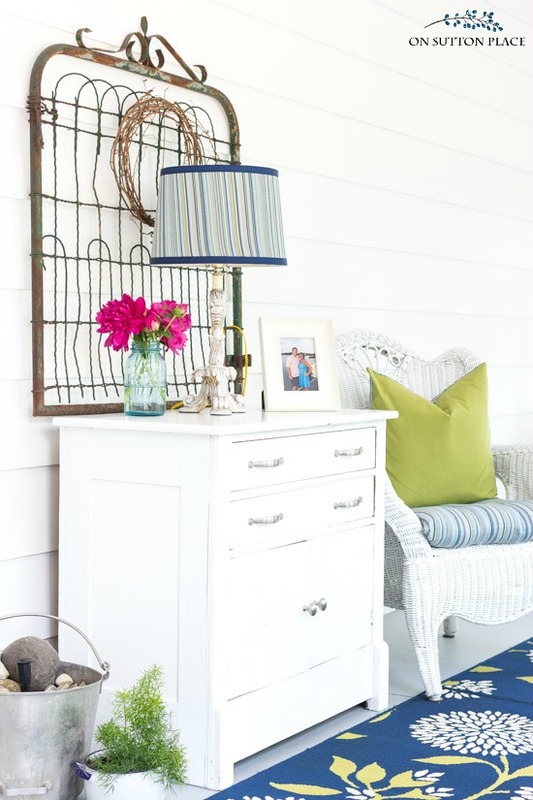 LOVE LOVE that gate…it was the perfect addition to this pretty space!! Simply beautiful. . Now all you need is a good book and a glass of sweet Tea !!!! Well said Shirley…sometimes seeing something brings back such strong memories and feelings. It’s those reminders that we all should cherish. Thank you for such a lovely comment! That is a very sweet story. And there is nothing like an old rusty gate. It is beautiful on your porch! I love it and especially that it has a story behind it…how sweet of your daughter to take the extra steps to get it for you. 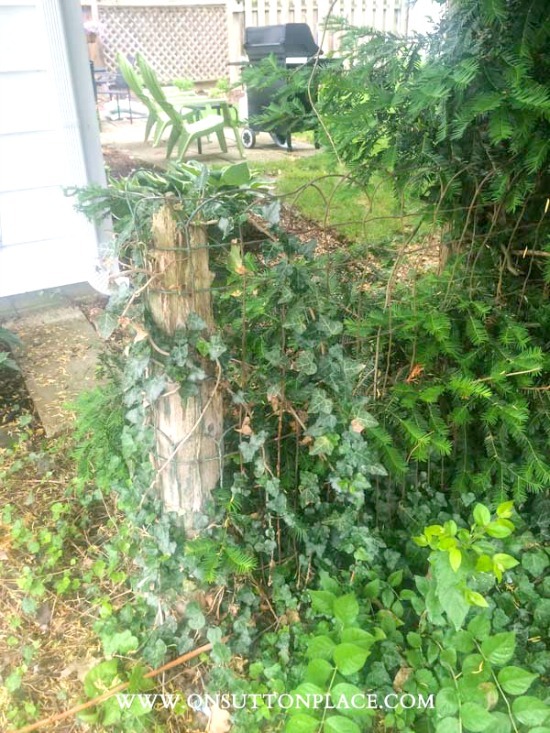 Love the fence and the story, enjoy your post very much! It looks wonderful and the love in you “voice” as you speak of your daughter is so obvious. Blessings! You and your daughter, what a good looking pair! Your back porch is something I would lover to have and to look like yours do! But here in the Netherlands we have brick houses and no porches. Usually our gardens are not that big either. Thank you for your very inspiring posts! Keep them coming. How precious that your daughter figured out a way for you to have the gate. Things like that mean so much to us mothers. Love the way you coordinated into your back porch. Quite lovely!! Enjoy your blog so much ! Yes Bev they really are! I absolutely love this gate on your porch! It’s touches like this that just bring on the personality, don’t you think? Well that is why you are good at decorating as you know exactly what to do to keep things from getting too stiff and as for your daughter, yes she is beautiful and so are you. You did very well, Ann!!! Thank you Jeanette…you leave the best comments. They always warm my heart! I love gates and I have a wider one that I use as a trellis. I really like how you’ve used yours and I might have to copy it! Thanks for sharing and I love your posts. Oh a trellis is a fabulous idea. I just may have to copy YOUR idea! It’s perfect, and you are lucky to have such a thoughtful daughter. It looks so nice against the white walls :) Pinning!! You have the perfect spot for that lovely gate and your story is so much better than if you had just bought it. What a great story! I do remember when your daughter bought that home. A sweet story and I’m sure your daughter Elizabeth will smile each time she visits and relaxes seated in your beautifully decorated porch. I love that you share your yearly fashioned porch. The colors you choose always make me smile. I received my herb markers in the mail yesterday from Kim. They’re perfect.